US President Donald Trump Wednesday announced the withdrawal of American forces from war-torn Syria after he claimed victory over the Islamic State group (ISIS) that he said was the only reason of the American military presence in the Middle East country. “After historic victories against ISIS, it’s time to bring our great young people home!” Trump said in a video on Twitter. “We have defeated ISIS (Daesh) in Syria, my only reason for being there during the Trump Presidency,” he added. The retreat, an official in the President’s administration told Reuters, will be total and will begin 60 or 100 days from now. “All US military forces will be pulled out once final stages of last operation against ISIS is complete,” the official who requested not to be named, said. The State Department personnel in Syria would be pulled out within 24 hours, the official added. There are currently 2,000 US troops on a train-and-advise mission in Syria, on the side of Syrian Democratic Forces (SDF), which control one third of the Syrian territory. Trump’s decision took allies and US officials aback. 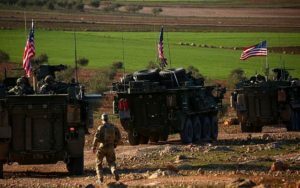 US lawmakers attacked the decision noting that Turkey, which has demanded US support for the SDF because it contains terrorists and PKK-connected fighters, would benefit from the decision. Israeli politicians assailed Prime Minister Benjamin Netanyahu over the decision claiming that Iran and its Lebanon-based ally Hezbollah would entrench their presence in Syria where they have been fighting on the side of embattled President Bashar al-Assad. Netanyahu in a statement said US top diplomat Mike Pompeo assured him that Washington despite the withdrawal will continue influencing events. “I spoke with US President Donald Trump [on Monday] and yesterday with US Secretary of State Mike Pompeo, who told me that it was the president’s intention to withdraw their forces from Syria and made it clear that they had other ways to express their influence in the arena,” the statement said. Israel has used the US presence in Syria as “bargaining chip” to persuade Russia, which is lso supporting Bashar, to prevent Iran from increasing its presence in country.